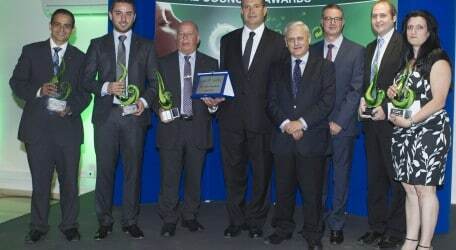 The Local Councils of Pembroke, Sliema, Kirkop, Attard and Paola won recycling awards during the second annual GreenPak Local Council Awards organised by GreenPak Cooperative Society. These awards recognise the local councils that have distinguished themselves in waste recycling for the betterment of their locality. Three local councils were nominated as finalists in each of the six categories as finalists. Pembroke Local Council won the ‘Best Overall Performance’ award for the second consecutive year with a 58% waste recovery rate, while the Sliema Local Council won the ‘Most Supportive Locality’ award. The awards ‘Best Performance: Recycling Bag’ and ‘Best Performance: Household Glass’ where adjudicated to the localities of Kirkop and Attard respectively. The Paola Local Council was awarded the ‘Most Improved Locality’ award with 75% improvement in recycling terms. For the first time, Inspire Foundation initiated ‘The Inspire Foundation Award’ as a token of appreciation to those local councils participating in the used clothes collection campaign held in 2013. Of the many councils that participated in this event to raise money for the Inspire Foundation, the Kirkop residents collected most used clothes and scooped their second award having given to charity an average of 4kgs of clothes per household. The award ceremony was attended by more than 100 local council mayors, executive secretaries and councillors. The Minister for Sustainable Development, the Environment and Climate Change Leo Brincat and the Parliamentary Secretary for Local Government Dr Stefan Buontempo congratulated the local councils and encouraged them to keep improving on these results in order to reach Malta’s recycling targets set out by the EU. Besides receiving the trophy and certificate of achievement, the winning local councils were each given a cash prize of €1,000 to support ongoing environmental projects within the same locality for the benefit of its residents. GreenPak, a MEPA authorised scheme, is the largest waste recovery scheme in Malta. The organisation is a founding member of EXPRA, a not-for-profit international organisation promoting the concept that it is industry itself that should take up recycling and let recycling be a burden on Government or Local Authorities. GreenPak has for the past decade been one of 35 national producer responsibility systems operating under the PRO Europe umbrella.